Jaundice is the condition characterized by yellowness of skin, whites of eyes, mucous membranes, and body fluids due to deposition of bile pigment resulting from excess bilirubin in the blood (hyperbiliruinemia). Phototherapy (light treatment) is the process of using light to eliminate bilirubin in the blood. Your baby’s skin and blood absorb these light waves and change bilirubin into products which can pass through their system. For over 30 years, phototherapy treatment in the hospital has been provided by a row of lights or a spotlight suspended at a distance from the baby. This would provide light shinning directly on an undressed baby (with diaper on) whose eyes would need protection from the light with soft eye patches applied. Today, advancements in technology have led to a new phototherapy system which gives effective treatment without the inconveniences of conventional phototherapy treatment. Are there side effects to using Phototherapy? Babies under any type of phototherapy treatment will have frequent and loose bowel movements that are sometimes greenish in color. This is normal since this is the way body removes the bilirubin. This will be temporary and should stop when treatment is completed. Contact your doctor if it persists after treatment is completed. With Bili Tx’s one-button operation and no-maintenance technology, parents will find treating their infant’s hyperbiliruinemia at home to be easy and reliable. Bili Tx’s small size and light weight make the device easy to carry, transport and store. 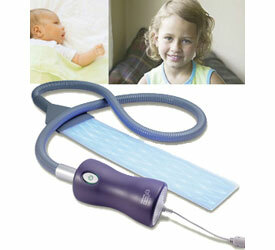 Bili Tx is versatile and fits easily into a mother’s or caregiver’s hand while delivering treatment. Its parent-friendly sling, fiber optic panel and long cord make it easy to nurse, hold and even carry the baby without interrupting phototherapy.